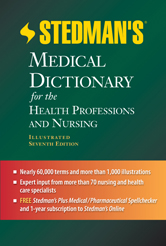 This thoroughly updated Seventh Edition contains the medical terminology used in more than 30 of today's fastest growing health profession areas plus comprehensive inclusion of entries suited for the nursing field. The book includes enriched color images and photographs and detailed images by Anatomical Chart Company. More than 70 leading consultants from health professions and nursing contributed to the enhancements of this edition.